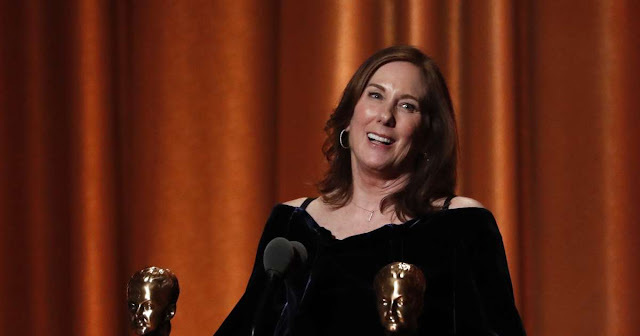 Star Wars Producer and Lucasfilm Head Kathleen Kennedy received the Academy of Motion Picture Arts and Sciences’ annual Irving. G. Thalberg award alongside husband and Jurassic Park Producer Frank Marshall. She is the first woman to win the award, which was presented to her by longtime collaborating pal Steven Spielberg. Watch a video of the event after the jump. "I am very proud to be the first woman to accept this award. But I am also not the first to deserve it and I am 100 percent sure I am not the last... It is my hope that with the inclusion of these powerful new voices, we might just bring the world back to its senses and maybe, just maybe, shatter a few glass ceilings along the way,” stated Kennedy. You can read more at Reuters.